If you would like to display files created in MS Word, Excel, Equation, PowerPoint, Corel, Mind Manager, etc. you can use the OLE component. The OLE component can display files created with any application that supports OLE 2.0. If this application supports in-place activation, you will also be able to edit these files without quitting SuperMemo. For example, if you insert an MS Word document into an OLE component and switch to editing mode, SuperMemo menus and toolbars will be replaced by Word menus and toolbars. As all other components, the OLE component is available from the Compose toolbar. To be able to edit files inserted in the OLE component you will need an appropriate server application (e.g. MS Word, Corel, Mind Manager, etc.). However, you do not need any software to display these files in the presentation mode. The OLE component will show as an empty rectangle. You may need to turn off Scaled property on the element menu or in your template due to sizing problems with various OLE objects. If you want to import a ready file, right-click the OLE component, and choose Insert OLE object, click Create from File in the Insert Object dialog box and choose the file by typing its name or clicking Browse. If you want to create a new file and edit its contents, right-click the OLE component, and choose Insert OLE object, and pick from the list of OLE servers available in your Windows installation. When you click OK, the appropriate server will be called and you will be able to edit your file (e.g. Microsoft equation, Excel chart, PowerPoint presentation, etc.). When you press Esc, SuperMemo will display the file in the presentation mode (i.e. the way it will look during repetitions or on the computer of the users of your collection). Please note that the pop-up menu in the OLE component is mode sensitive, i.e. it will display the OLE server pop-up menu in the editing mode and standard SuperMemo options in the presentation mode. In the presentation mode you will be able to use options such as Display At, Answer, Border, etc. In the editing mode you will be able to use options depending on your OLE server (e.g. 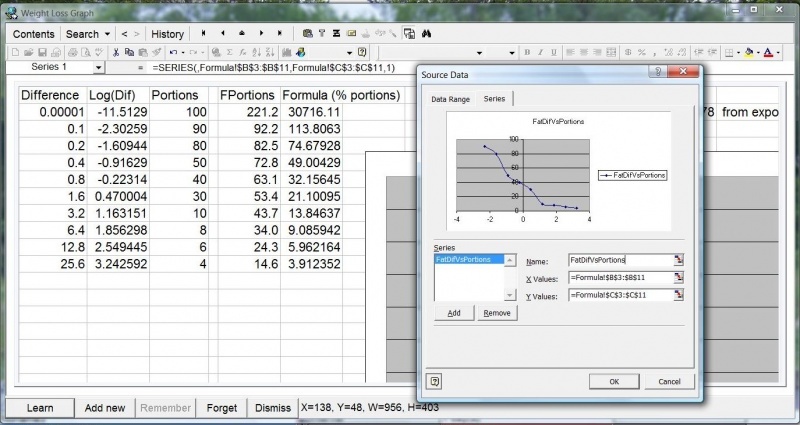 if your server is MS Excel, you will be able to use Cut, Copy, Format cells, etc.). If your OLE server shows stability problems or does not work seamlessly with SuperMemo, your OLE file may still work fine in the presentation mode. You will be able to redistribute your collection without worrying about its performance on the user's machine. 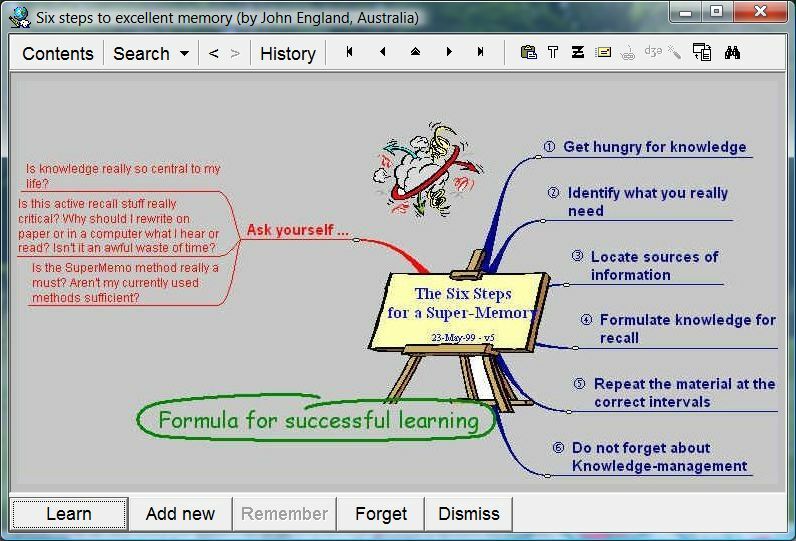 Is there a possibility to learn with mindmaps I've created in MindManager. Where can I find a description? I'm having troubles with large mindmaps: I can't see the entire one. What's the solution? If you are using mind-maps with OLE, their behavior will depend on the mind-map OLE server. If you are using mind-maps with HTML or with the image component, you can view the file with F9. It is important to know that in active recall, you only need a small portion of your mind-map to efficiently execute your repetitions. Ideally, you should convert your mind-map to a graphic file and paste only small portions of this file as separate topics. Then, you can use questions referring to individual portions of the map or use occlusion tests to cover parts of the map. Asking questions about the mind-map is by far simpler and often more effective. Occlusion tests are harder to build but easier to recall. Consequently, you may want to use occlusion tests on large volume material where speed of learning is more important than precise map recall. Another approach is to use the web browser (HTML) component. Then use Insert HTML link : HTML file (on the HTML component pop-up menu) and link to the PDF file. Using this option the PDF file is not immediately visible as only files of type *.txt, *.htm, *.rtf are listed. To visualize the PDF files on your drive type in *.pdf in the file name field and they become visible in the File window. Naturally, you need to have Acrobat Reader installed to view the file in SuperMemo. You can, of course, copy the text with the tools provided for the PDF viewer and use it for further SuperMemo purposes. The same method works for Excel files, Word files, etc.